Doctor Kerry Weaver, chief of emergency medicine, first came to County General Hospital as chief resident or inter chief, later becoming attending physician in the ER. In her current job, chief, abrasive DR. Weaver remains undaunted by her physical disability. Her unmatched abilities in critical situations have earned her colleagues respect- if not their affections. Slowly we learn more about history, adopted, Africa, her mother, but why uses she a crutch? From: Unknown. Spent time in Africa. Parents: Names unknown (was adopted). Other relatives/notables: Adoptive parents (deceased), ex-husband. Ex-husband - Kerry revealed in early season 7 that she was once married to a surgical resident. Mlungisi - Although we don't know for sure that Kerry had a relationship with Mlungisi, in season 2 it appeared as though they had a romance when she was living in Africa. Ellis West - Kerry and Ellis had a brief fling in season 4, but ended their relationship after Kerry suspected he was sleeping with her just to get his company into a partnership with the hospital. Kim Legaspi - Kerry and Kim began a relationship in mid-season 7. It ended after Kerry didn't want it to go public. Sandy Lopez - Kerry and Sandy, a firefighter, had a relationship in mid season 8. They broke up briefly, but got together again late in the season. ER Chief Resident - Kerry was the chief resident of the ER in season 2. 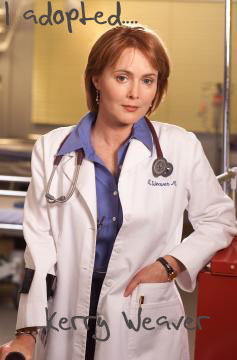 ER Attending - Kerry was elevated to attending status in season 3. ER Interim Chief - Kerry took over as the interim chief after Dr. Morganstern resigned in season 4. She held this position until mid season 5. Chief of Emergency Medicine - After an extensive search for a new chief, Kerry got the position in early season 6.